Your resume is your marketing tool to make a good first impression on the hiring manager. Your CV should highlight your work experience and skills in a consistent, clear format. A well-written resume is the most important step to landing a job interview, and ultimately a job offer. Our Recruiters critique resumes on a daily basis, so we want to share our top resume writing tips with job seekers. A well-written resume is the most important step to landing a job interview, and ultimately a job offer. 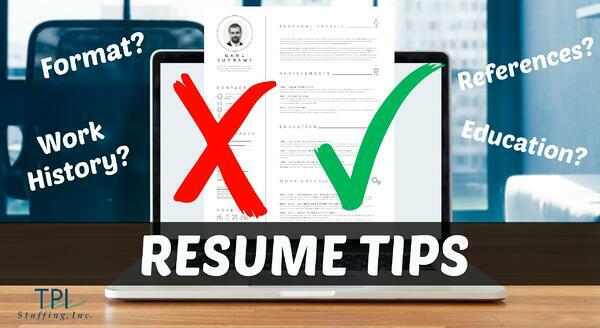 Is your resume showing your qualifications in the best way possible? Your full name and contact information should be centered at the top. Use a professional email address for all business-related job inquiries or job applications. List your best contact method, usually your cell phone number and include your personal email address where you can be reached best at. Unless you have a strong message you are wasting valuable resume space in the most powerful location of your resume. Depending on what stage your career is in (entry-level or professional candidate) will determine how you'll start this section. "To obtain a full-time position..."
"To secure a job with an established organization who encourages growth and the ability for career advancement." A Recruiter may only spend 10-15 seconds glancing over your resume, so get right to your skills and experience. Instead, you'll want to differentiate yourself from other applicants by using keywords which describe your unique work experience and skills. Education is an important piece of information to include on your resume. GPA is optional. Only include your GPA if it's higher than a 3.0 and if it's been less than 3 years since you've graduated. Showcase your potential by learning how to list your work experience in your resume the right way. The experience section on your resume is very important to show a potential employer your career path. For job seekers, you'll want to start by listing your current job or most recent first- this is called reverse chronological order. Generally, you'll want to go back 10-15 years in your work history or consider relevant experience. If you are an entry-level candidate or student with no prior work experience, you'll want to include any internships or part-time positions. Hiring managers want to know where you've worked, what you've done, and what you accomplished personally as well as for the company which you worked. It's extremely important to ensure your dates of employment are correct, as most employers will conduct employment verification to confirm your work history with previous employers. Focus on work history, duties and responsibilities in concise statements using strong verbs. This section is vital to capturing the hiring manager's attention, so limit to 3-5 bullet points for each position. 1. Start with your most recent or current job. 2. Include the Company Name, Location, your Job Title, and dates of employment. Your CV should highlight your work experience and skills in a consistent, clear format. Chose Times New Roman 12 point font to use throughout your resume. Double check your grammar, punctuation and formatting before you submit your job application. Your attention to detail may make or break landing an interview. The goal of your resume is to grab the attention of the hiring manager...in a good way. Your resume should highlight your work experience and skills in a consistent, clear layout. Interested in learning more resume writing tips to improve your resume? Watch our Resume Writing Tips video below. TPI Staffing, Inc ©Copyright 2018. All Rights Reserved. Site Credits.